ZION NATIONAL PARK — A group of 150 Nevada students, many of whom had never seen a squirrel or a deer in real life, are spending three days and two nights at Zion National Park as part of the “Concrete to Canyons” program developed for inner-city students to experience nature. 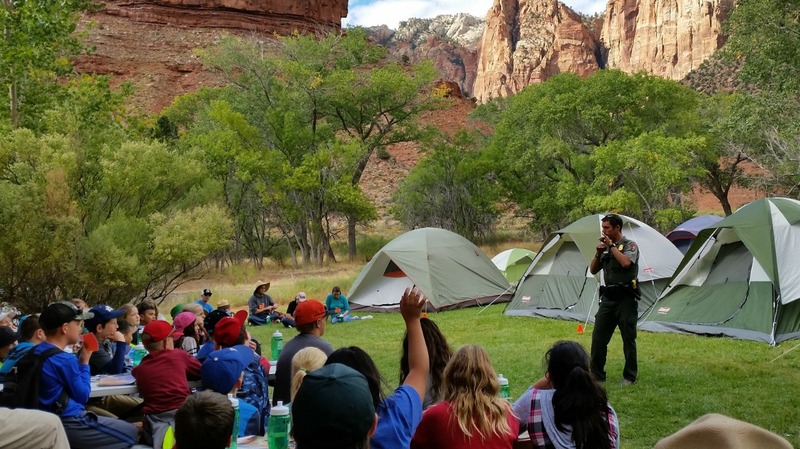 The program, launched in 2013, introduces the children to Zion’s natural wonders during a wilderness adventure designed as an in-the-park, overnight camping experience and orientation for underserved youth, park spokesman John Marciano said. 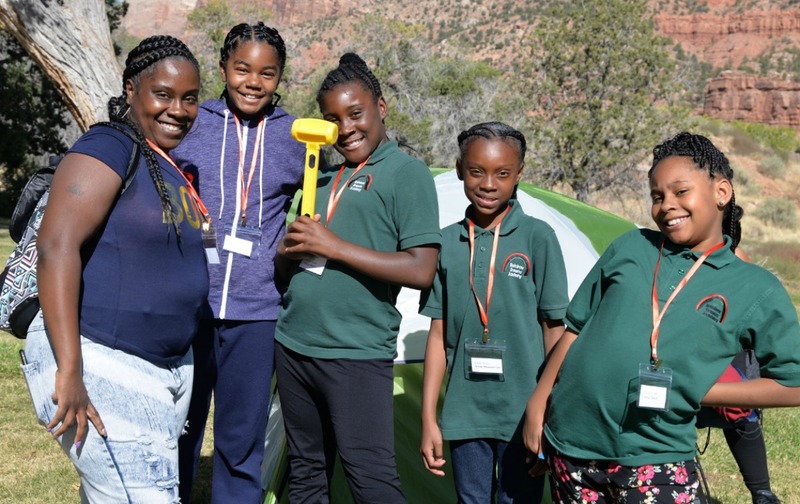 “It’s our youth, the next generation, who will be the future stewards of our parks, so we are thrilled to participate and help to create positive life-changing experiences for the kids,” Marciano said. This year’s participants were fifth- and seventh-graders, many of whom attend the Rainbow Dreams Academy, a Las Vegas charter school. In all, six schools in Mesquite and Las Vegas were involved. 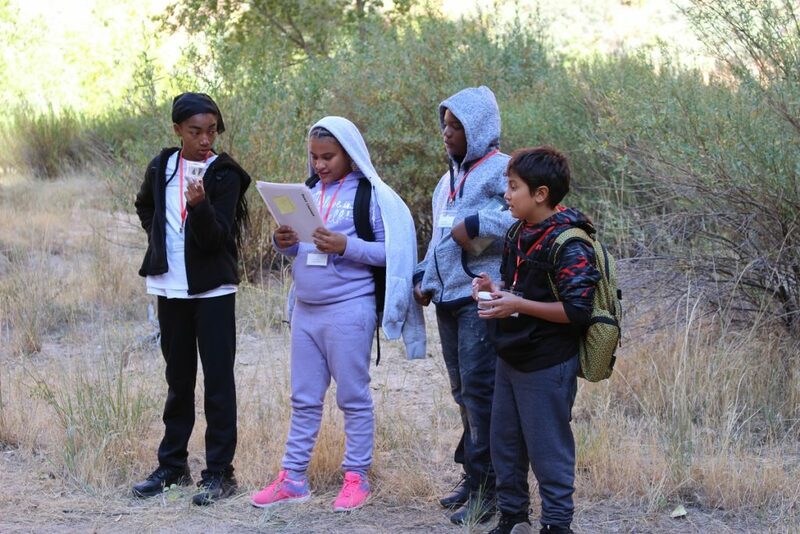 For many of the children this was the first time they have hiked, camped or experienced wildlife in its natural habitat and for some it was the first time visiting a national park. “We are excited about expanding the program to more students, as well as to students from the schools in northern Utah as well,” Marciano said. 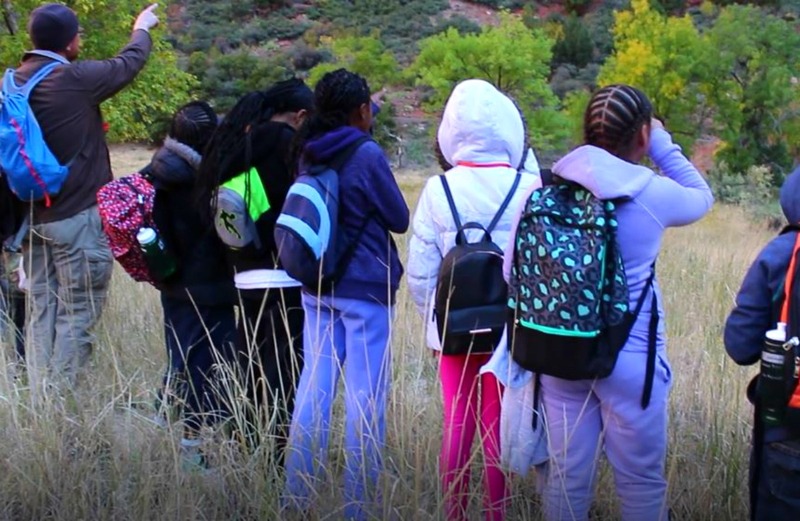 Concrete to Canyons allows students, along with parent and teacher chaperones, to participate in ranger-led educational programs, hikes and talks, as well as learn about conservation, wildlife, geology and stewardship, and what makes Zion unique. Most of all, they learn something new about themselves. 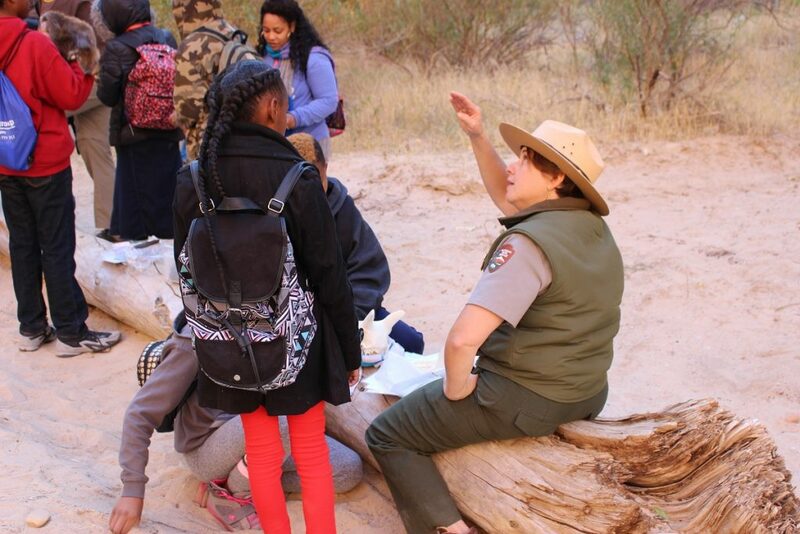 Once the students arrive at the park, they work together to set up their tents and campsite, and for the next two-and-a-half days are led by park rangers through a series of activities and hikes, including night hikes and stargazing. When they return home, students make a presentation to their schools and local communities about their experiences. Melissa McNeely, a fifth-grade teacher at Rainbow Dreams Academy, said the program gives the children an opportunity to see “a whole other world” and see firsthand the concepts they learn in the classroom. “You know, it’s really hard to put into words because for every student it’s a different experience,” McNeely said, adding that 26 students from her school are participating. It is her second year chaperoning the group. “These kids were so excited and they knew it was going to be something they’ve never done before,” she said. 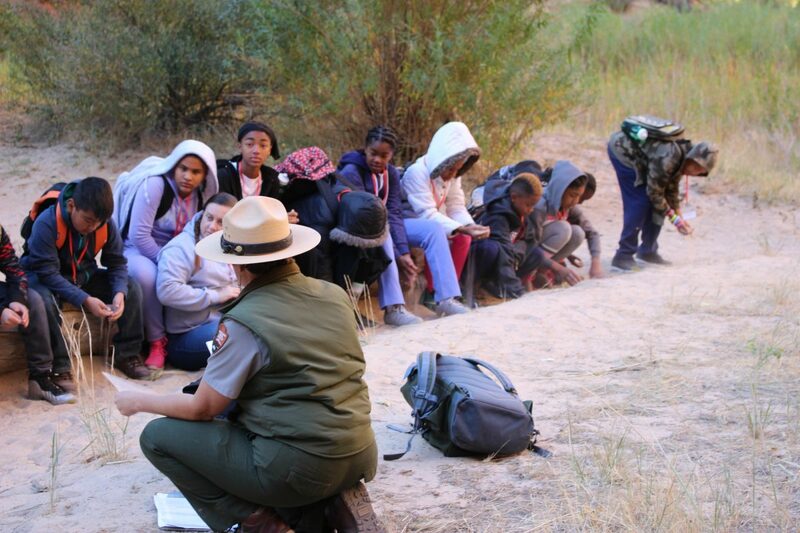 Thursday’s program included an outdoor, curriculum-based lesson with Zion National Park Ranger Andi Buttram, who guided the children through educational exercises relating to natural habitats, the way animals adapt to various environments and studying the animals in their natural setting. 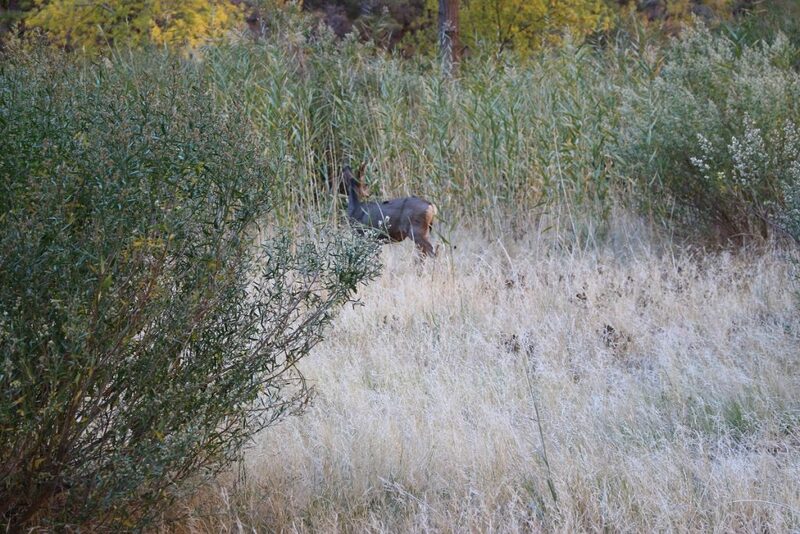 Concrete to Canyons combines everything she loves, including kids, the outdoors and learning, she added. Parent volunteer John Dillard accompanied the students on the trip and said he is impressed and excited about the program. He mentioned that the students are learning about the forces that went into producing the landscape and the various methods nature uses to create differences in geography. 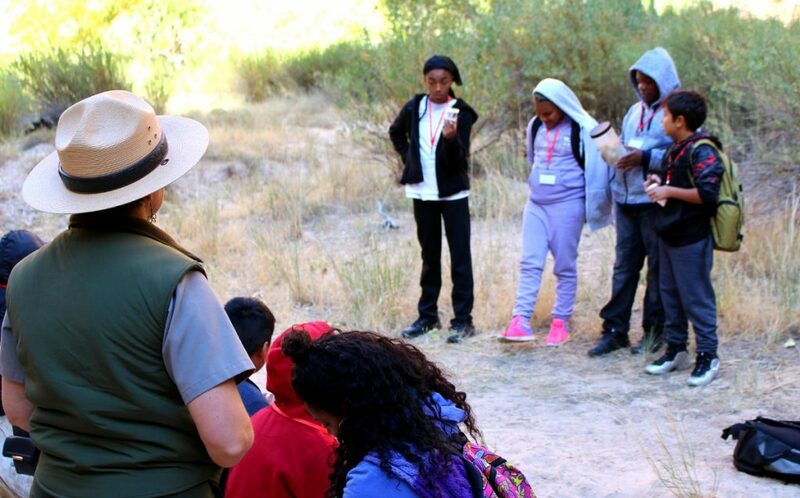 He went on to say how much benefit the children were getting from spending time with the park rangers, and how much they were learning as they observed deer, turkeys, ravens and other wildlife. Another parent volunteer, Destiny Beavers, has an 11-year-old daughter attending Rainbow Dreams Academy and wanted to accompany the students to help out during the adventure. “My daughter was extremely excited to come, and I wanted to be able to help during the trip and to watch my daughter learn,” Beavers said. Concrete to Canyons is supported by the Zion Forever Project, which is funded through partnerships and community support from organizations and park enthusiasts throughout the state and beyond.